Turning Technologies was honoured to be invited to the 14th Service User/Carer Conference on the Experiences of Mental Distress in Practice, hosted by the University of Southampton. This event was hosted at the University to outline the Experiences of Mental Distress in Practice, for the University’s large nursing and midwifery student body, in which James is a Lecturer in Mental Health Nursing. James invited Turning Technologies to the conference to see the latest Clickers Theatre project titled ‘Kiss Your Baby Goodbye’ (read more about Clickers Theatre here: http://turningtechnologies.co.uk/blog/2016/02/TurningPoint-in-Mental-Health-Nursing). The Clickers Theatre has been implemented by James at the University of Southampton in his classes to help engage the students and produce an innovative teaching method for which James has been highly commended with various National awards and most recently, a prestigious McGraw Hill Award nomination. To put the Kiss Your Baby Goodbye play together, James ‘loaned’ a Human Book from the Human Library (read more here: http://humanlibrary.org/), an anti-stigma organisation which has been designed to build a positive framework for conversations that can challenge stereotypes and prejudices through dialogue. These Human Books are real-life people, with real-life stories to tell – and Turning Technologies was honoured to meet Claire, whose story Kiss Your Baby Goodbye was based on. James wrote the play based on Claire’s story and several of his students volunteered to act out the play, which would then stop at various intervals for a question to be posed to the audience using TurningPoint. At the conference the student audience were invited to sit down to watch the play and ResponseCards were handed out to them. A hush fell upon the lively room as soon as the actors walked out, and from the get-go everyone was transfixed. 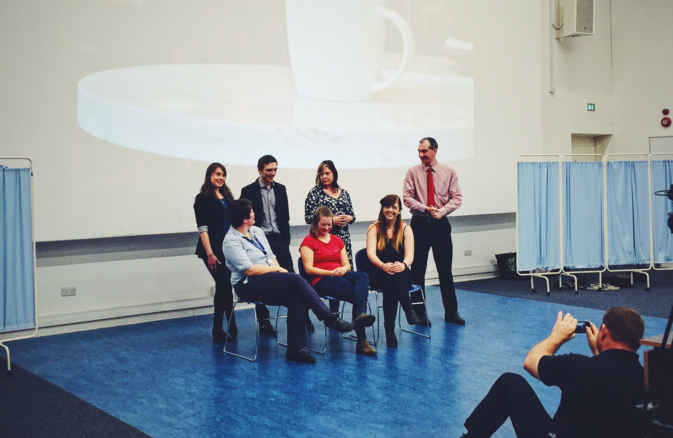 At appropriate moments, James stopped the play to pose a question to the audience, and the nurses and midwife students had to vote for the best level of care for that particular scenario. Once the results were displayed on the screen using TurningPoint, the play would carry on according to the course of care the audience had chosen. Due to the sensitive nature of the play, the ResponseCards gave the students an anonymous voice – a way for them to choose the care they thought appropriate and see (without penalty) what could happen if their choice was picked. The ResponseCards helped the audience engage with the actors and the particular scenarios in front of them and there was no fear of judgement for their choice. After the play finished, the students sat in a stunned silence for a few moments before the Q&A took place. The play really helped emphasise the gravity of best practice when dealing with mental health and the ResponseCards fully complimented and supported this teaching method, helping every student to feel valued and responsible..